The River Severn is the longest river in Great Britain at a length of 220 miles (354 km), and the second longest in the British Isles after the River Shannon in Ireland. It rises at an altitude of 2,001 feet (610 m) on Plynlimon, close to the Ceredigion/Powys border near Llanidloes, in the Cambrian Mountains of mid Wales. It then flows through Shropshire, Worcestershire and Gloucestershire, with the county towns of Shrewsbury, Worcester and Gloucester on its banks. 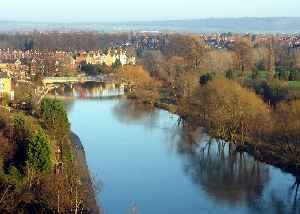 With an average discharge of 107 m3/s (3,800 cu ft/s) at Apperley, Gloucestershire, the Severn is by far the greatest river in terms of water flow in England and Wales. 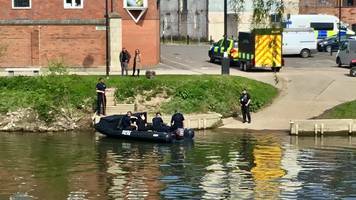 West Mercia Police officers and a dive team are continuing investigations around Frankwell Quay.